The Reconnections have taught me that the best teaching situations are the ones where the Workshop Leader gets "done" as much as the people who come to learn. If that is so, then I must say that the Neo-Shamans Event, held last week in our Kirkland Office, was one of the best teaching situations ever. Everyone got activated. Any why not? This is the time for activation, and it's also the time for integrating the divine masculine and the divine feminine. I probably could have written you all sooner about the details, but I have really been tuckered out by all these incredible 3D contacts with powerful people this month! Both Nina and I have been excited, provoked to ponder, introspective, and delighted with all these opportunities for interact, while being stretched to the limit keeping our usual work processes in motion as we did it! Yowwww! Beginning with the "Heart and Soul Resonance" session on June 5th, moving through the Venus Transit, featuring time with Tricia Nobbs at Chehala in the Olympic Mountains--this awesome month ended with a reunion with my dear friends Antron Bay and Grampa Carl, and a first-time dance with Aum-Rak Sapper from Guatemala. The workshop, itself, contained so much power--in the diverse energies that were present--we could have all sat around and played cards for the whole time and still walked away super-energized. And a host of age groups were present, beginning with Magic Michael from New York (early 20s) and also including Grampa Carl from Tucson (85, going on 60). Alan from England was there, as well as Theo from Bulgaria (via Buffalo, NY), to represent the European Sector. And I haven't even begun to speak about the loco-locals who frequently grace our events. All I can say is: "What a potion to brew up!" Just to see them all sitting there, in a circle, was enough for me. Hearing them share experiences, and watching all these divergent energies dance together, put the whole weekend over the top. I am still amazed at whatever forces told me to mix Antron with Aum-Rak at the same event! They're both quite powerful, yet extremely different in their styles. It's like mixing fire and ice--and each Shaman became both elements during some part of the weekend. Aum-Rak is very gentle and light in her presentations. Antron can be forceful, and loves to explore the darker tones of human interact. All of us loved to "party," and I especially enjoyed the Saturday morning shape-shifting exercise...... as we danced furiously to Guatemalan drum sounds, and took on the energy of the monkey. Antonio, in the Discussion Forum, has often referred to me as "The Big Gorilla." I do believe he would have been delighted to realize, during that dance, how right he is! The underlying tone was set from the beginning. I told my old friend that we needed him to join Aum-Rak and myself for this special event, and the primary purpose was to highlight and support a unique form of Goddess Wisdom as it comes into the Seattle Area. Our goal, from the outset, was to surround and highlight Aum-Rak, as she taught us about the Mayan ways and shared her ceremony--demonstrating the love of the SHE, in all her focus and power. Part of the lesson, of course, turned out to be how difficult it can be for the HE to stand back and allow her that kind of space. Our night of introductions--Friday Evening--was filled with vibrant promise. Each presenter could easily have filled up the entire weekend with what he or she could offer. The Reconnections were there to guarantee that "mix and mingle" would prevail. The power of the HE, and the gentle wisdom of the SHE.........encapsulated in one place. It was a search for a certain quality (a joining of spirits), not just quantity that comes when one side of the energy spectrum speaks out over the other. I have never realized how beautiful and relaxing an opening ceremony can be. As you can see from her pictures, Aum-Rak is quite serious about the ceremonies over which she presides. She is a Priestess, in every sense of the term. As I watched her prepare the spices and incense, and call in the four directions for our meeting, all cares and anxiousness of the day drained out of me. In some ways, it reminded me of a formal Japanese Tea Ceremony. By the time the group became ready to introduce ourselves to each other, I was totally peaceful and glowing. The essence of Shamanism is the Art of BRIDGE-BUILDING, uniting opposites into the same space. This is also the goal of Alchemy. In a new article I just wrote about Star Kids and Empathic Healing, I mention that one core element behind what is called "Bi-Polar Illness" is the fact that those who deal with it are probably Shamans by nature. 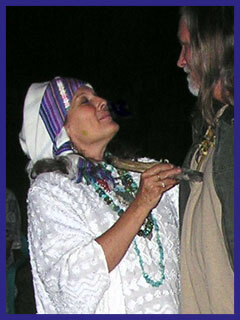 The initiation to service for a Shaman can be powerful and intense. It can last as long as 7 years, and is often accompanied by severe mood changes and physical distress. Indigenous Societies have learned to deal with this, and they support the person who is going through the process and make provisions for it in their daily lives. Modern urban society is scared to death of mood swings. But we are going to have to get over this. What used to be the life-purpose of a few "special" individuals will soon become a common experience for a majority of people on the planet. To create our own experience of Bridge-Building, each presenter was given space to lecture and lead us in meaningful processes. Each chose to lead the group at doing things and discussing issues the other would probably never do, if he or she was alone. This was an activation in and of itself. And I got to hear about it, believe me! My job was to hold onto both sides of the energy, love it as self, and see that the walls in my building didn't melt. The people loved it, I loved it, and Aum and Antron worked their ya-ya's off trying to adapt to it. For sure, I didn't expect things to get this intense. But it warmed my heart when, during a break on Sunday, Aum-Rak and Antron sat facing each other, and welcomed each other's diversity into their hearts. I was also quite excited by the fact that they did this in the exact place where I do my bodywork therapy each day. I thought to myself: "Wow! This masculine-feminine synergy will be an earmark of all my sessions from this moment forward." And, indeed, it truly has been so. The Sacred Fire Ceremony of Saturday Night was a perfect highlight for the event. The above-picture is precious to me, indeed. My two-friends exchanged some powerful vibes in that moment, looking into the sunset at my friend Val's farm in Duvall, Washington. Each of us fairly hummed during the whole evening. I even got to do some drumming, which I haven't done in years. Several from out of state also attended, and many have commented to me how meaningful it was for them to see. Ward and Val, who own the farm, had dug a special pit for the fire, right in front of a huge tree that sits over-looking an herb field in their back yard. As we were leaving, Val said to me: "I'm going to keep that fire pit." She then laughed and said: "I'm going to refer to it as the AUM PIT." Indeed, Aum-Rak had informed Val that her property would be blessed and sacred from that night forward. She said: "All the herbs that travel from this place, to their various destinations, will carry a special blessing as well." It is rare that I come in contact with someone who carries herself with the grace and elegance that I saw in Aum-Rak Sapper. In the 10 days we had to spend together, I was continually amazed by the love that flows forth from her eyes. Antron was as powerful as ever, and his and my reunion (after 6 years apart) was a cup of delicious cold water for my soul. At one point in the seminar, Grampa Carl literally brought down the house with his story about using Shamanic Healing to cure his daughter, who nearly died from serious illness in the middle of the night. There wasn't a dry eye in the house! Gosh I love that man! As I said earlier, the people who came for learning certainly seemed happy with what they got---but it was the leaders of the event who really got a chance to grow. The energetic backwash that flows from such a blending is always nourishing and strengthening for all concerned. And I must say, I could not have gotten through all this if it wasn't for the selfless and loving efforts of my dear Nina, who hosted many visitors at her house, and surrounded the whole affair with her sweet presence and hospitality. In many ways, I saw the Neo-Shamans Event as being a Pre-Conclave Conclave. I didn't set out to have this happen, but it certainly ended up being that way. It was especially meaningful that we put out the itinerary for the Autumn Solstice Gathering on the day that Aum-Rak arrived. If this is the shape of things to come, I think we'd all better fasten our seat belts. "The Spirituality of the Nineties was a hybrid creature. It was a mixture of knowledge and traditions that are as new as last Monday, and as old as the trees and stony guardians that stand along the coastline and commune with the sea. In the same way that the United States has become a "melting pot" for the Earth, gathering together a vast number of beings---diverse in race, creed, and national origin---so the faith that ushers in this New Era has become a kind of "soup" that is made up of the best and most flavorful portions of nearly every religious and philosophical tradition that has come before, plus some new elements that are just now making their entrance into physical life and reality. With a banner of Universal Oneness flying from it's tallest tower, this new creation, which could probably best be called "Millennial Spirituality," is coming into view from behind the smoke of dissention, and the religio-imperialism that has so characterized the last 2000 years. This is the Spirit that will carry Planet Earth through the "Eye of the Needle," and into the Fourth Dimension. Many voices will cry out, citing reason after reason to cling to the "old ways" of the sword. Still, when the smoke clears away (as it surely will), the vision remaining will be one of peace, tolerance, inner exploration (rather than outer expansion), and goodwill toward men! Yesterday was the "promise." Soon will come the fulfillment." My friends, I have been witnessing a bit of what the Guides are describing here. The same gauntlets and swords that have been brandished between nations have been flashing between males and females for as long as I can remember (and then some). Won't it be wonderful to see swords and spears turned into magic wands and healing hands of love? Our collective transformation is getting closer. Humanity's Futureself is at our doorstep. With it comes the inevitable challenges to ego that accompany all great strivings for beauty and meaning in life. To be or not to be! That is the question. The greatest test of strength is not found in demonstrations of power. I do believe that, once again, a U.S. President is re-discovering that. When a person knows........truly KNOWS that he or she has power..........there is no need to demonstrate. It can be read on the face, in the glint of an eye, and is written on the wind. The greatest demonstration of power is restraint--coupled with a heart that is wide-open, and seeking to understand. I am thinking now of the movie "Braveheart"........where William Wallace's uncle stands next to the boy as they play bagpipes at the funeral of his father, slain by English soldiers. The boy picks up a sword, and strikes a familiar stance of readiness to do battle. After all, he had lost big. Now felt like his time to fight back. Wisely, his uncle took the sword from his tiny hands and said: "First, you have to learn to use THIS........." and he tapped the boy on the forehead. "Then," he added, holding up the sword....."I'll teach you to use THIS." I love that movie, and I respect the time in history it reflects. I know we've had to go through each and every period of our growth, as a race, before we could arrive at this place of extreme readiness to leap into Expanded Consciousness. I want to grab the computer from young William's hand today...........and hold onto all the techno-wizardry and power that it symbolizes.......and I want to say to the boy: "First, I want to teach you to use THIS........" and I would tap him in his heart space........and then.......well.......I think you can figure out the rest. My thanks to all who participated in this powerful gathering in Kirkland! I look forward to "Building the Crystal Family" as it comes our way in September. The word "conclave" means "with keys." And each person who comes to these events seems to hold a key that opens some new part of my heart and mind. What a gift. What a blessing. Enjoy your July! As Santar would put it: "Solaris Homily!" Daniel Jacob, July 6, 2004. MORE PICTURES OF THE EVENT TO FOLLOW SOON! Copyright, 2004, by Daniel Jacob. All Rights Reserved. May be copied and shared for purposes of personal growth and/or research. All reproduction for profit, by any means, requires the written permission of Reconnections, Inc.